We are celebrating the Wednesday Challenge’s 8th Birthday his week! Where has the time gone! They do say that time flies when you’re having fun and we hope that you have as much fun with the challenges as we do! We all really appreciate YOU for joining in with us and we look forward to seeing your birthday themed entries! 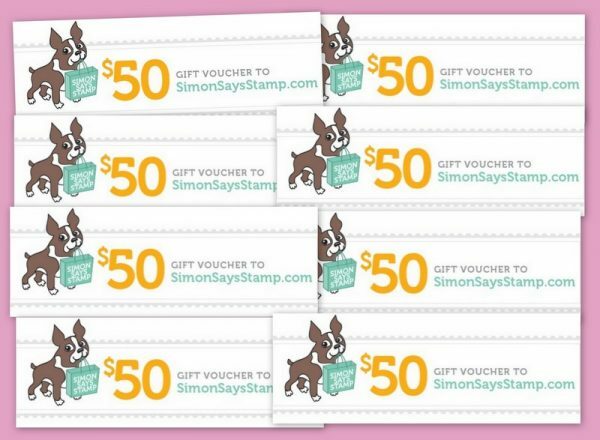 A birthday is always special and the lovely and very generous Heidi will be giving away not one, not two but EIGHT, yes EIGHT $50 Vouchers to shop at the fabulous Simon Says Stamp Store. Woo Hoo!! I made a magical birthday card for the challenge. I created my background by sponging distress inks – Candied Apple, Picked Raspberry, Worn Lipstick, Spun Sugar, Twisted Citron and Mowed Lawn. I started with a light hand with all the inks, then came back thrice to get a good blend and intense colour. I then spattered the panel with water and copic opaque white. Love spatter on the background. 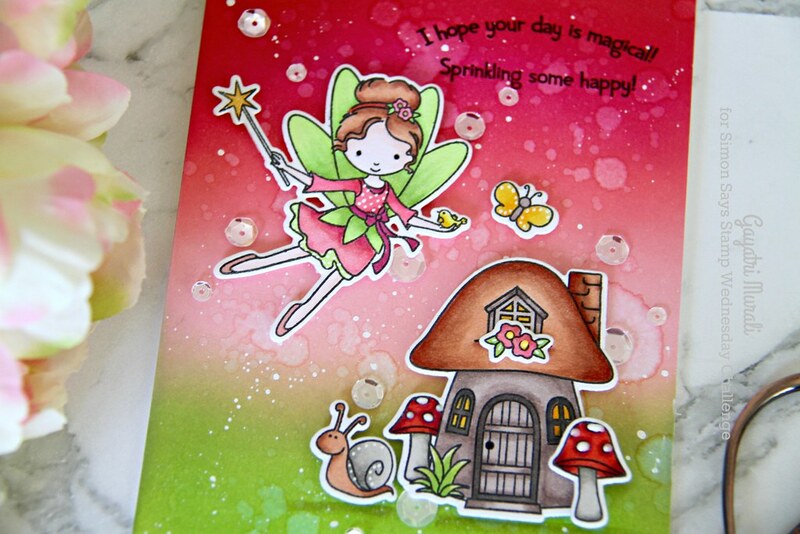 I then stamped the images from Secret Garden stamp set and copic coloured the image. Die cut them all out using the coordinating dies. I then adhered the images on the panel. Some flush glued and others using foam adhesive for dimension. I used Sakura white gel pen to add some interest to some of the coloured areas. The Nuvo Crystal Drops on the centre of the flowers and on the toadstool. 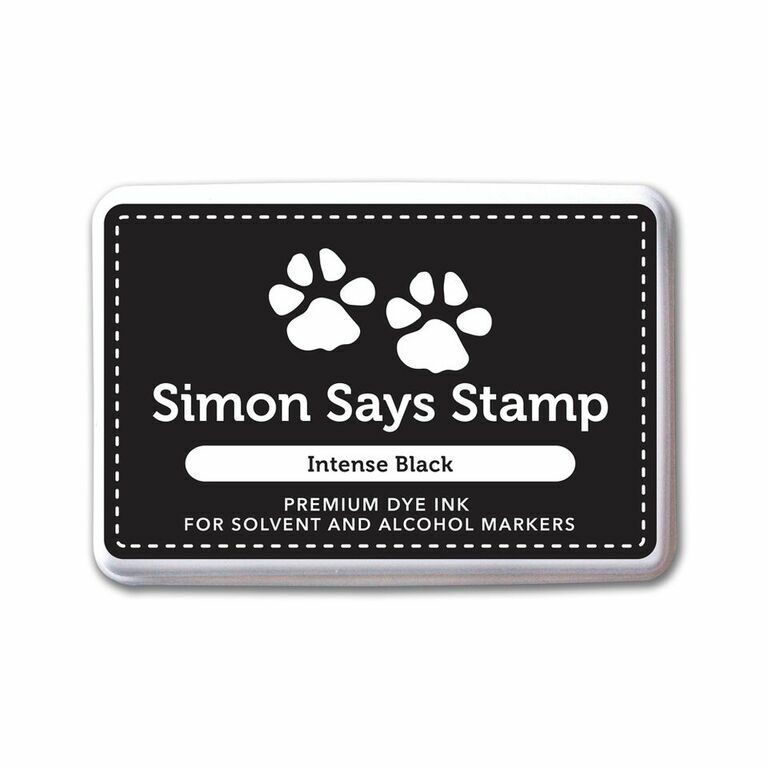 Then I stamped the sentiment on the top right using MISTI and Versafine Onyx Black Ink. Finally embellished with the sparkly clear sequins from Pretty Pink Posh. Love how this card turned out. Honestly I made this card last minute. I am waiting for my New Beginning release goodies to arrive. I wanted to use them to make my take for the challenge. So that why I had to do this last minute and pretty good huh! lol! So now it’s YOUR turn to join in with our birthday celebrations!! Thanks so much for stopping by. See you soon with another post. So so sweet and I LOVE the background, gorgeous! What a darling card, Gayatri! Someone special will adore it! 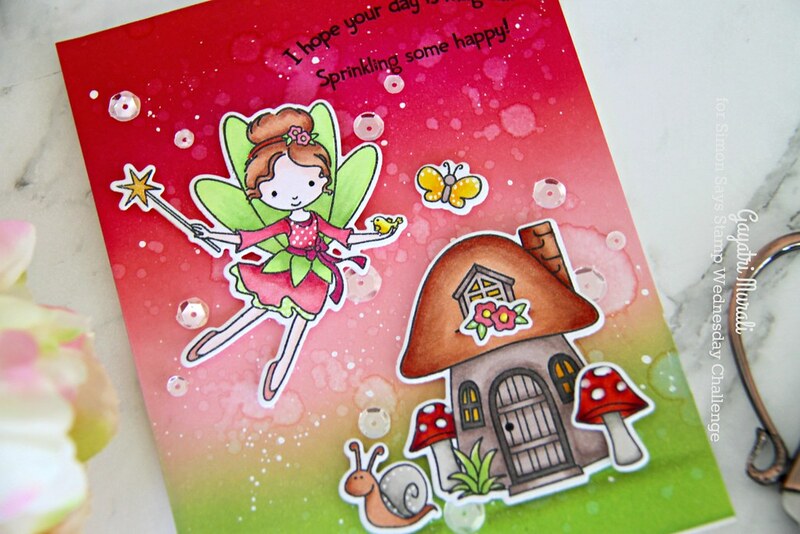 I love the background and the color combination!Beautiful card,Gayatri! SOOO cute! Love the blending and the colors!!!!!!!!! The little mushroom house is just sweet. Very beautiful card. Thank you for sharing. Magical & Beautiful! I absolutely LOVE this!! So pretty, love the colour of your background and super fun scene you have created.